A paper shredder sparked an emergency at a doctors surgery in Lancaster, say firefighters. Four engines were called out to the Lancaster Medical Practice on Dalton Square at around 4.50am on Tuesday, after a cleaner discovered the unfolding emergency. Fire crews say the cleaner heard the alarm ringing and found the surgery to be smoke logged. She immediately left the building and dialled 999 for help. 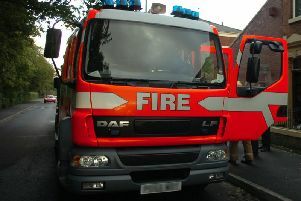 A spokesman for the fire service said: "A paper shredding machine caught fire in the basement of a doctor's surgery. "Fortunately, the fire was contained to the paper shredding machine. "A fire alarm sounded and a cleaner entered the building and discovered the surgery was smoke logged. "Firefighters dealt with the incident quite quickly. "We got there just in time as the fire was located in a room full of files and combustible materials. "We used four breathing apparatus and a hose reel to extinguish the fire and a ventilation unit to clear the smoke. "It was very lucky the cleaner arrived when she did, and she did exactly the right thing by leaving the building and dialling 999 for help." Crews remained at the scene for around one-and-a-half hours. Staff at the surgery confirmed it is open as usual today.